How Much Cargo Space is in the 2019 Mazda CX-3? Are you looking for a nimble subcompact crossover that is tailor-made for family fun? Look no further than the updated and refined 2019 Mazda CX-3 at Earnhardt Mazda Las Vegas. Expected to arrive in Las Vegas in the spring of 2018, the Mazda CX-3 will feature a plethora of interior refinements that upgrade luxury, ride quality and storage space. If you are drawn to the athletic lines of the Mazda CX-3 and you love family adventures, you may want to know – how much cargo space is in the 2019 Mazda CX-3? READ MORE: How Much Cargo Space is in the 2018 Mazda CX-9? Built to deliver an athletic performance in the subcompact crossover segment, the Mazda CX-3 does not forsake the versatility and family-friendly interior that are staples of the crossover design. Armed with an updated interior that features improved insulation, high-quality materials and redesigned front seats, the Mazda CX-3 will provide the same award-winning level of comfort as its predecessor. With the addition of an electronic parking brake, the refined Mazda CX-3 adds more storage space in the center console – perfect for family adventures. Families who choose the Mazda CX-3 as their next vehicle will enjoy a competitive 12.4 cubic feet of cargo space behind the 60/40 split-folding second-row seats that is tailor-made for day-to-day errands. When you are in need of more cargo space, the rear seats can be laid flat to increase the available cargo space to 44.5 cubic feet of cargo space. 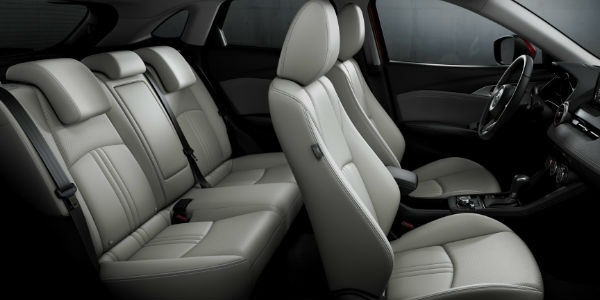 With room for five passengers in a luxury-infused interior that features 35 inches of rear legroom and 37 inches of rear headroom, your Mazda CX-3 will be comfortable on long road trips. With the updated design, drivers and passengers in the 2019 Mazda CX-3 will enjoy class-above luxury and technology. A standard 7-inch MAZDA CONNECT™ touchscreen infotainment sets the bar high and provides one-touch access to Bluetooth and a rearview camera. The addition of a Direct Tire Pressure Monitoring System, Smart City Brake Support and Blind-Spot Monitoring with Rear Cross-Traffic Alert will upgrade family safety at every turn. Interior highlights include advanced safety systems, Parchment or Black premium leather upholstery, a BOSE® 7-speaker sound system, a power sunroof, Mazda Navigation and much more. READ MORE: How Much Passenger and Cargo Space is in the 2018 Mazda CX-5? Are you considering the Mazda CX-3 as your next family vehicle? Do you love to go on family adventures? If that sounds about right, you may want to know – how much cargo space is in the 2019 Mazda CX-3? Visit the Earnhardt Mazda Las Vegas inventory this spring to find out firsthand! This entry was posted on Thursday, June 14th, 2018 at 8:43 pm	and is filed under Mazda CX-3, Mazda Vehicles. You can follow any responses to this entry through the RSS 2.0 feed. You can skip to the end and leave a response. Pinging is currently not allowed.